Most people know that New Orleans has been sinking, but exactly how much has it sunk? 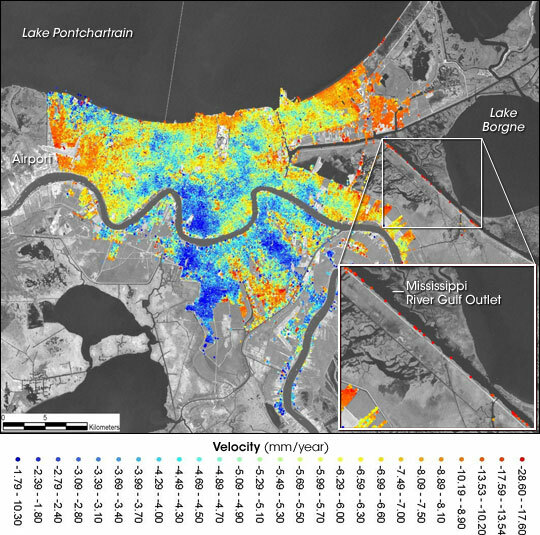 In a paper published in the journal Nature, an international team of scientists determined the subsidence (sinking) in New Orleans in the three-year period prior to Hurricane Katrina. The team used data collected by Canada’s RADARSAT satellite between April 2002 and July 2005. The researchers found that most of New Orleans subsided 8 millimeters per year relative to global mean sea level during that period. 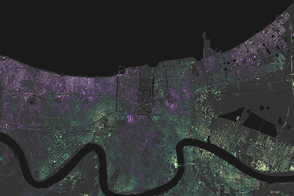 This map of New Orleans shows the average rates of subsidence that RADARSAT detected over the three-year study period. Red indicates the areas that sunk the most, up to 28.6 millimeters each year (just over an inch). Blue indicates the areas that sank the least. An inch a year may seem like a small change, but the researchers point out that the rate observed between 2002 and 2005 is probably at or near the slowest subsidence rate the area has experienced since the levees were first built in the 1960s: sinking probably occurred even faster just after the levees were first built. Indeed, many parts of the city were already meters below sea level in 2002. 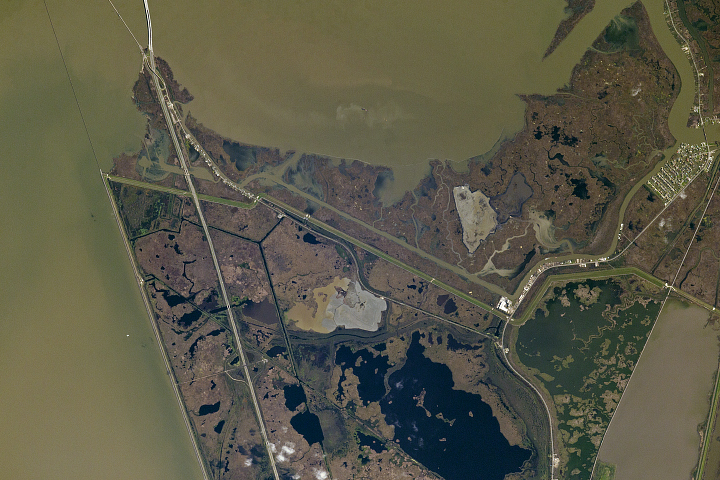 Historically, eastern New Orleans has seen the greatest subsidence in southern Louisiana. This part of the city was 3 to 5 meters below sea level when the hurricane struck and consequently saw some of the worst flooding. For example, the line of red dots along the Mississippi River-Gulf Outlet Canal (which failed during Hurricane Katrina) indicates that the area experienced some of the highest subsidence rates during the study period. 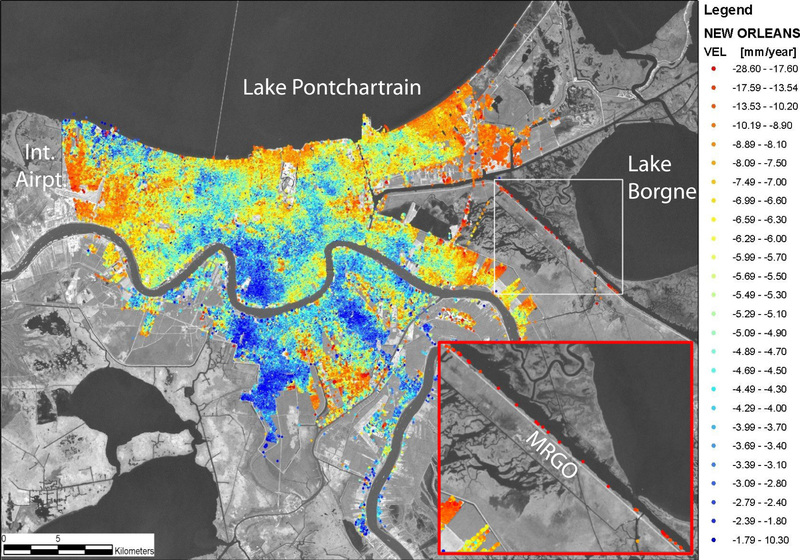 The research team measured subsidence by examining 33 RADARSAT scenes of New Orleans. RADARSAT can measure surface-height changes within millimeters, but not every kind of surface gives reliable measurements. Different kinds of ground cover, for instance, can rise or fall independently of the overall movement of the area. To obtain reliable measurements, the team focused on the intersections of paved surfaces (such as streets or sidewalks) with buildings and on building roofs. During the three-year period studied, these surfaces moved away from the satellite, and the team concluded that this movement was consistent with subsidence. Scientists have proposed several causes for subsidence in New Orleans. These causes range from natural ones, such as settling of coastal sediments and movement of the Michoud fault, to human ones such as draining wetlands, diverting sediment-bearing floodwaters from the Mississippi River, and pumping ground water. Dixon, T.H., Amelung, F., Ferretti A., Novali, F., Rocca, F., Dokka, R., Sellall, G., Kim, S.-W., Wdowinski, S., and Whitman, D. (2006). Subsidence and flooding in New Orleans. Nature, 441, 587-588. Burdeau, C. (2006, April 3). Geologic faults cause structures in New Orleans to sink, study says. Washington Post. Image adapted from Dixon et al., 2006.